"Stop making fun of me!" Orion Classics has released the first official trailer for an indie horror comedy of sorts titled Clara's Ghost, which initially premiered at the Sundance Film Festival earlier this year. I kept hearing some good things about this but haven't had a chance to catch up with it yet. Set over the course of a single evening in the Reynolds family home in suburban Connecticut, Clara's Ghost tells the story of Clara Reynolds who, fed up with her self-absorbed showbiz family, finds some solace in and guidance from the supernatural force that she believes is haunting her. The film stars Abby Elliott, Bridey Elliott, Chris Elliott, Isidora Goreshter, Haley Joel Osment, and introducing Paula Niedert Elliott as Clara. This actually looks pretty damn good, something a bit different with all kinds of crazy things going on. See below. 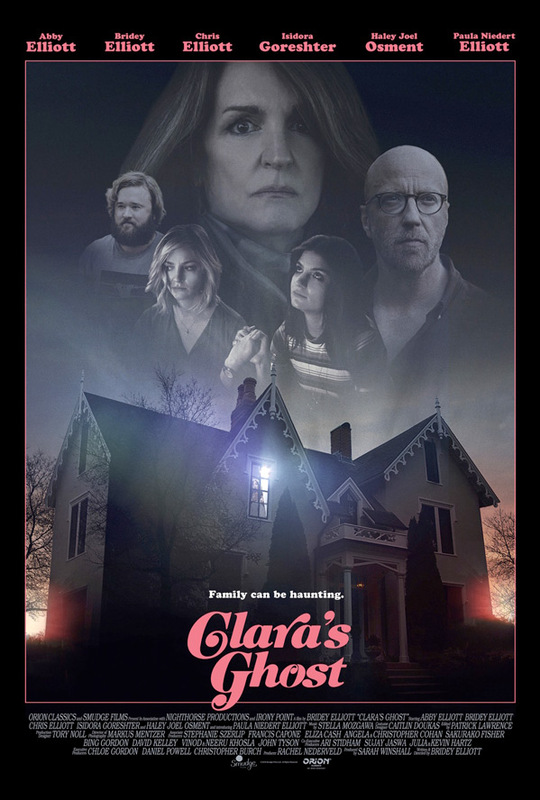 Set over the course of a single evening in the Reynolds family home in suburban Connecticut, Clara's Ghost tells the story of Clara Reynolds (Paula Niedert Elliott) who, fed up with constant ribbing from her self-absorbed showbiz family, finds solace in and guidance from the supernatural force that she believes is haunting her. Clara's Ghost is written & directed by actress-turned-filmmaker Bridey Elliott, making her feature directorial debut after a short film previously. This first premiered at the Sundance Film Festival earlier this year, and also played at BAMcinemaFest this summer. Orion will release Elliott's Clara's Ghost in select theaters + on VOD starting December 6th this fall. For more info, visit the film's official website.